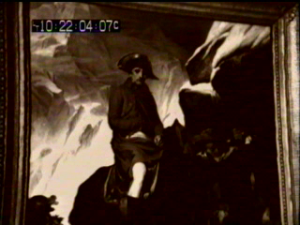 In the fifth screening of the ‘Dramatic Spaces’ season, The Journal of Bridget Hitler, Colour Separation Overlay (CSO) is used in an entirely different way than in our previous double bill of ‘studio trickery’, this time within a self-reflexive drama-doc that brings together an eclectic mixture of generic devices. 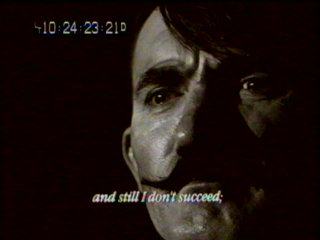 Developed by Philip Saville and Beryl Bainbridge, the play is an ‘investigation’ (Cooke 2003:135) into Adolf Hitler’s youth, dramatising experiences recounted by his sister-in-law, Bridget (Siobhan McKenna), who was married to Hitler’s half-brother, Alois (Dennis Lill), in a memoir she published years later. Her account describes a journey that Adolf supposedly made to Liverpool in 1912 to visit them and their son Patrick William (Vincent Hall), and the family’s subsequent contact with Hitler during his rise to power in Germany. 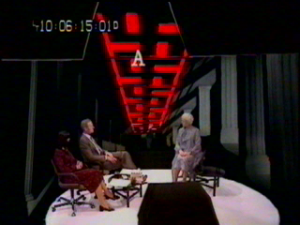 The production alternates between scenes of the elderly Bridget being questioned in a television studio about her recollections, and dramatic enactments of events she describes, often appearing first on giant video screens behind the studio discussion, before we enter into them fully. While Bainbridge’s 1978 novel, Young Adolf, formed a springboard for the ideas in the play, The Journal of Bridget Hitler is a radical departure from her historical novel’s ‘pathetic and precisely calculated farce’ (Ratcliffe 1981: 9). Offering a darker, less comical, representation of Hitler it is also a complex study of the processes by which historical characters are constructed. 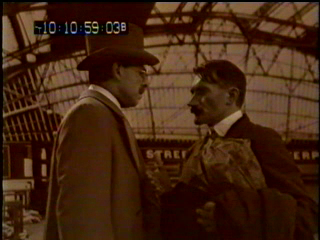 As well as demonstrating Hitler’s own cultivation of his public persona by presenting his transformation from a destitute ‘unwanted and disagreeable’ guest (in Bridget’s words), to dictatorial ruler of Germany and his suppression of unwanted aspects of his family history including his trip to England, Alois’ illegitimacy and bigamy, and Hitler’s role in the death of his favourite niece, Geli (Nina Zuckerman). The play’s construction of Hitler is also put into question through the studio interrogation of Bridget whose account, we are reminded, is subjective and potentially unreliable. Furthermore, the processes of construction involved in television production are frequently revealed in scenes which punctuate both the dramatic and studio discussion sequences, refusing, in Brechtian fashion, to allow our complete submersion into the fiction. 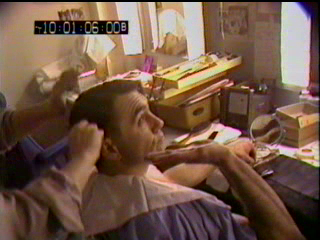 At the beginning of the play we see the actor Maurice Roeves who plays Hitler go to his dressing room, where he is made-up and has his hair cut for the role. 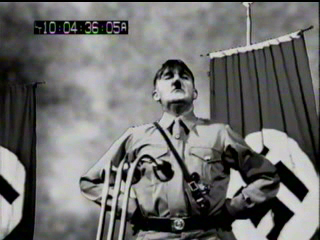 After an incredibly convincing performance, delivering a speech in German against a CSO backdrop of Nazi banners, the image behind Roeves changes to a duplicating electronic effect and then, accompanied by a drum roll, a sudden change of shot reveals him against the blue screen used to generate the CSO effect, standing on a stage in a studio with members of the crew applauding him. In a later production scene which interrupts one of the dramatizations set in Weimar Germany, we see Saville mentally preparing Vincent Hall (who plays Patrick William) for his next take by explaining his character’s motivations (below). 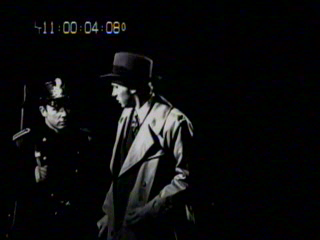 Some of the scenes of the cast and crew preparing and interacting with each other are shot on 16mm film using a hand held camera, their verite style suggesting spontaneity and authenticity. 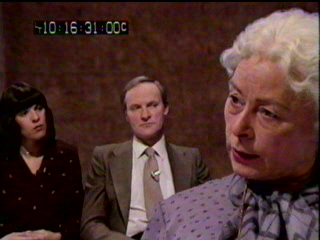 The degree of ‘authenticity’ of these ‘behind the scenes’ moments, never clear from the offset, is cast into further doubt when, in a scene of the cast lunching in the BBC canteen, Siobhan McKenna remains in character as Bridget, chatting to the production team about her experiences of her brother-in-law, as if the group are on a break from the recording of her studio interview. A fight then breaks out with a group of skinheads sitting nearby (left) after Maurice Roeves, messing about, gives a Nazi salute. As Cooke (2003: 135) says, ‘past and present, “reality” and fiction, are interwoven in the drama’, making it hard to differentiate between them. Saville’s masterful cinematography during these scenes evokes different genres- nostalgic period drama in Edwardian Liverpool, 1920s Busby Berkeley musicals for young Bridget’s (Shevaun Briars’) time in Monte Carlo, and crisp film noir for Weimar Germany, an aesthetic aptly forged by European emigres in Hollywood. The combination of these aesthetics into a tapestry of different textures and styles of footage makes the play even more remarkable as an achievement in studio production, and richer as an exploration of how genres carry meaning, consistent with the play’s overall concern with historical construction. 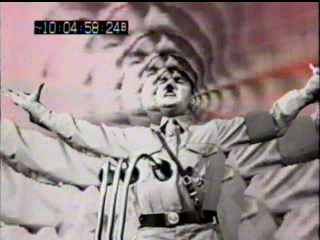 However, crucially, the play allows its dramatic scenes to serve as powerful and poignant moments of insight into Hitler’s personality, as Griffin-Beale notes, ‘we are not distanced from the performances within these flashback scenes, even though in-between them we are […] constantly reminded that we are watching actors in a studio’ (ibid). 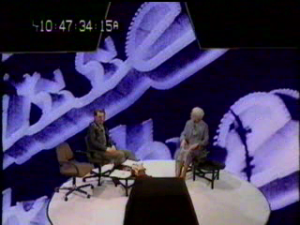 Saville uses a plethora of interesting visual and generic devices throughout: some, such as embedded textual quotes, real historical footage and photographic sequences, strongly associated with documentary, and others, such as unusual Quantel videographic effects and CSO backdrops, more suggestive of the aesthetics of music programmes such as Top of the Pops, or graphic techniques used on the news. The accompanying images illustrate Hitler’s words, showing first paintings of impoverished and suffering humanity followed by those of the ruling elite, matching the speech’s transition from the struggling masses to ‘the fittest’ who have come to be dominant. 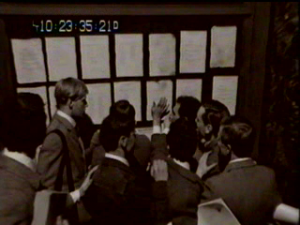 We see Hitler searching, in vain for his name, on a list outside the Akademie der Bildenden Kunste, (Academy of Fine Arts), his disappointment thus associated with his subsequent ideological development. 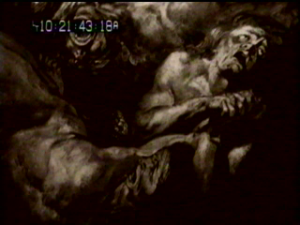 The powerful, expressionistic sequence climaxes with swelling music from Wagner’s anti-semitic opera, Die Meistersinger Von Nurnberg, accompanying a camera movement in on Hitler’s (Roeve’s) face. Subtitles translate the German lyrics, ‘and still I don’t succeed. I feel it and yet I cannot understand it. 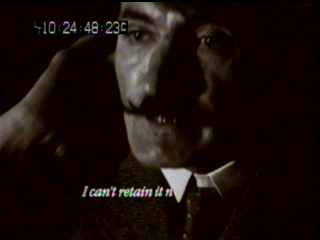 I can’t retain it nor forget it…’, as we see a montage of close up stills of him. Recognising its boldness, Michael Ratcliffe (1981: 9), gave it ‘nine out of ten for Ambition and Effort’, regarding it as ‘not, in my opinion, a success, but […]interesting’. Cooke (2003: 135) rightly highlights how integral the electronic tricks are to the very play’s very concept, noting, ‘the mobilization of this technology enabled the dramatic investigation to take place, rather than being merely a technical exercise’. It is this highly appropriate marrying of form and content that makes The Journal of Bridget Hitler such an important and unique production, and one that, sadly, ‘turned out to be not the beginnings of a new kind of television drama but one of the last creative flourishes before the onset of a new commercially driven era in which economics, not aesthetics, was to be the determining factor’ (ibid). Cooke, Lez, 2003, British Television Drama: A History, London: BFI. Davalle, Peter, 1981, ‘Personal Choice’, The Times, 6 February, p.25. 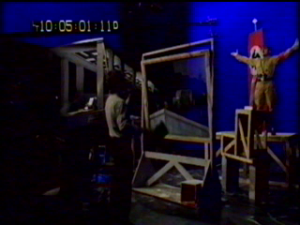 Griffin-Beale, Christopher, 1981, ‘”Bridget Hitler”: A Key Advance for Post-Production Techniques’, Broadcast, 2 February, p.14. Ratcliffe, Michael, 1981, ‘The Journal of Bridget Hitler’, The Times, 7 February, p.9. This entry was posted in BFI Screening Series, Single Plays and tagged Brecht, CSO, Experimental drama. Bookmark the permalink. I worked on this play as a production junior & I remember it vividly. It was fantastic to see it again last night & be reminded of how truly creative it was in it’s use of visual effects. It did make me wonder why no-one uses them so creatively today. It should be acknowledged that Philip Saville collaborated on this with a very creative designer, David Myerscough Jones. 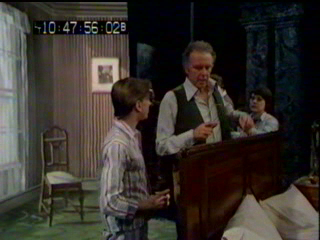 I remember Philip wanted a corridor in the studio at one point, which was news to David. 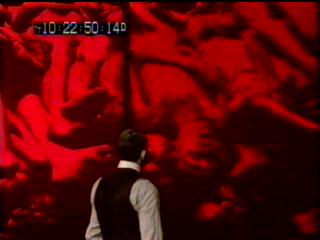 So David ‘created’ a corridor in about 2 minutes simply by placing tables with candles in a line receding from camera. So glad that you enjoyed the screening. I agree that we must not forget about the input of designers, particularly on such a visually distinctive production. I’m very interested to hear your recollections of David Myerscough Jones – thank you. A belated response to say how much I enjoyed seeing this again, having seen it on it original transmission. What a brilliantly conceived production ! The script, direction, design and performances were inspired (give or take a couple of wobbly moments !). Whether the account of Hitler’s visit to Liverpool was true or not was immaterial – the drama beautifully illustrated the human story behind the history. Julian Glover’s performance as a proto-Paxman was only one of the many highlights ! Was also very pleased to see Phillip Saville in the audience, and to be able to thank him for such a visionary production.